The European Space Agency (ESA) is the European equivalent of NASA. Recently, they’ve been uploading some amazing images on their website, so here is a selection of the best pictures they’ve published recently. 1.4 Pretty lines of light.. but where are they from? 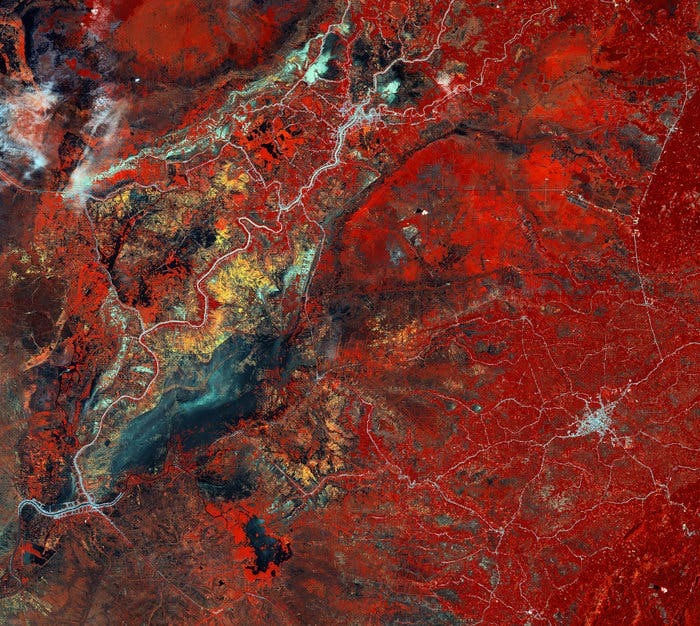 While the pastel tones and fine texture of this image may bring to mind brush strokes on an artist’s canvas, they are in fact a visualisation of data from ESA’s Planck satellite. The image portrays the interaction between interstellar dust in the Milky Way and the structure of our Galaxy’s magnetic field. In this image, the colour scale represents the total intensity of dust emission, revealing the structure of interstellar clouds in the Milky Way. The texture is based on measurements of the direction of the polarised light emitted by the dust, which in turn indicates the orientation of the magnetic field. 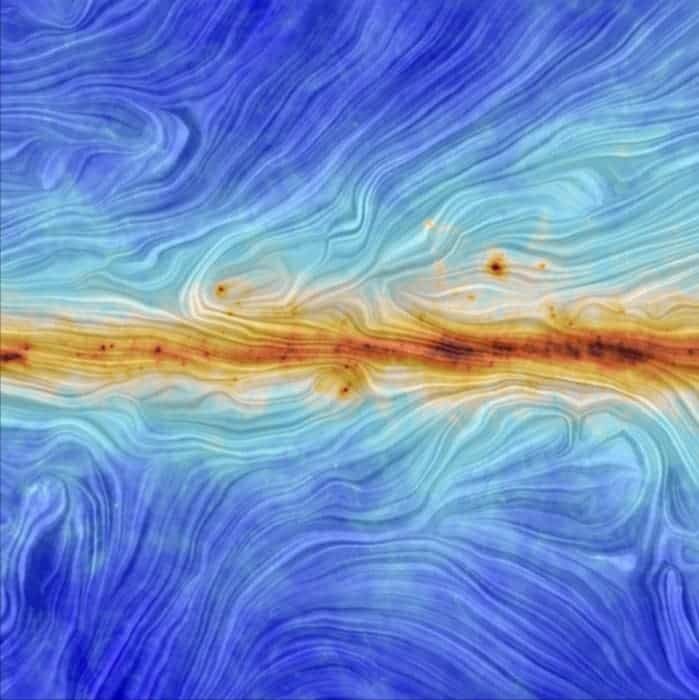 This image shows the intricate link between the magnetic field and the structure of the interstellar medium along the plane of the Milky Way. Image Credits: ESA/Planck Collaboration. Acknowledgment: M.-A. Miville-Deschênes, CNRS – Institut d’Astrophysique Spatiale, Université Paris-XI, Orsay, France. 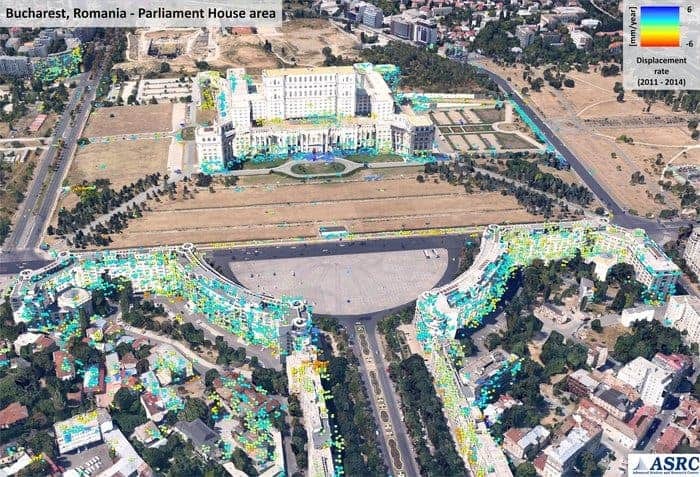 Satellite radar scans show various points on and around the Palace of Parliament in Romania’s capital, Bucharest, that are rising (blue) and sinking (red/orange) from 2011–14. You can get this kind of information through remote sensing, with satellite data. The radar data were processed using Persistent Scatterer Interferometry (PSI), a technique that can help detect and monitor movements over wide areas with high sensitivity. Image credits: Advanced Studies and Research Center. ESA astronaut Samantha Cristoforetti running the Skin-B experiment on the International Space Station during her Futura mission. This experiment gathers data on skin structure, oxygenation, hydration and elasticity. The goal is to develop a computer model of how skin ages. Image credits: ESA. 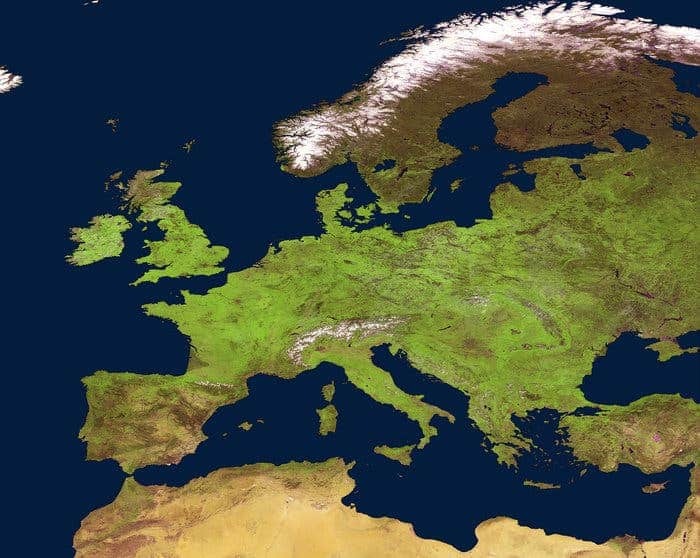 This image of Europe is a composite of Proba-V images from 1–10 May 2014. Launched just over a year ago, the washing machine-sized satellite carries the Vegetation imager designed after the French Spot-Vegetation mission, flown on the Spot-4 and Spot-5 satellites. This mission maps land cover and vegetation growth across the entire planet every two days. The information can be very useful for tracking of extreme weather, alerting authorities to crop failures, monitoring inland water resources and tracing the steady spread of deserts and deforestation. Image credits: ESA/VITO. 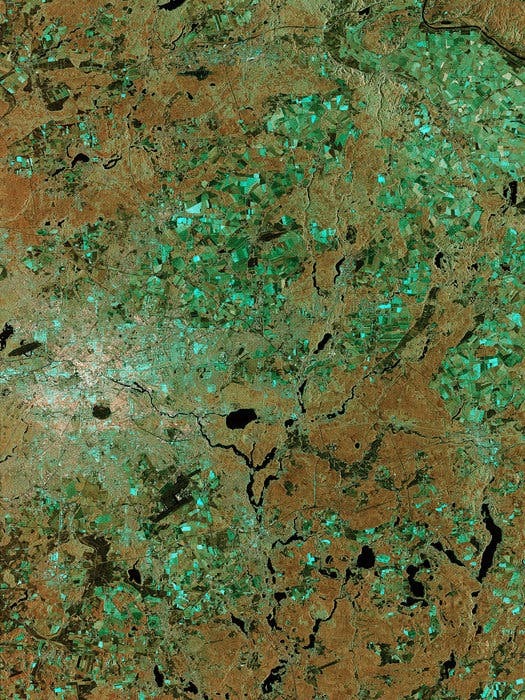 This image of Berlin, Germany, captured by Sentinel-1A is one of the first images delivered via the precursor European Data Relay System (EDRS) carried on Alphasat, which is in geostationary orbit 36 000 km above Earth. Image credit: Copernicus data/ESA (2014). Pretty lines of light.. but where are they from? Astronauts can set their cameras to take pictures automatically while they work on experiments, so they do not always know themselves – and computer programmes cannot help. 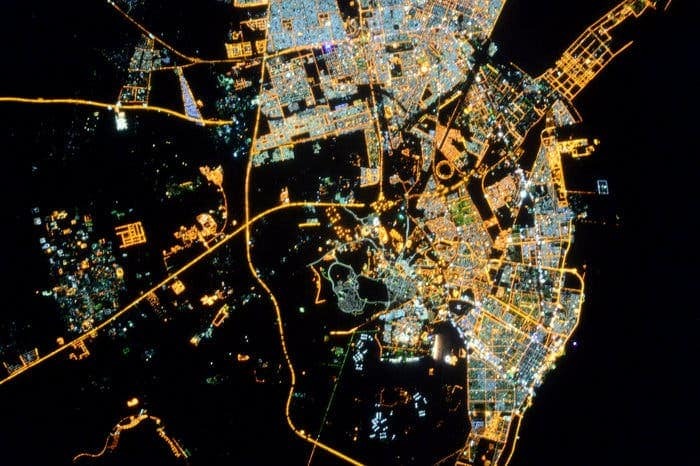 Helping astronauts find what they photographed can be fun but it also helps researchers investigating light pollution – unnecessary lights that shine upwards instead of guiding our way at night. Image credits: ESA/NASA.